If you’ve been following this blog for a while you may remember that, back in November, I was excited about the kickstarter project for Enter the Oubliette. 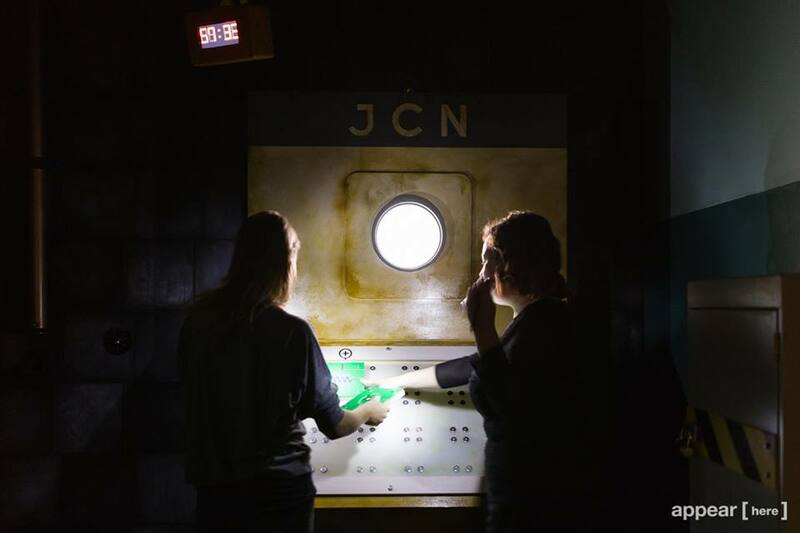 An escape room being set up by a group of people with an impressive history in gaming, storytelling and immersive productions, plus a well-received escape room in the US – what more could I want? Unusually for escape rooms, Enter the Oubliette is well located, close to a tube station and on a main thoroughfare. Given that, it seems particularly surprising that the outside of the Adventure Shop is so muted. Indeed, we almost walked straight past it, and only saw the sign at the last moment. Yes, Adventure Shop – part of the kickstarter project, was to set up a shop to showcase and sell artwork, stories and other things on an adventure theme. How successful they’ve been on that front, I have no idea, but it does lead to a pretty greeting area for the game, where we received a friendly welcome from an engaging host. You’re members of the resistance movement in New Pelagia, a sort of Orwellian Big Brother state where they control your thoughts, monitor your activities and insinuate themselves into every aspect of your lives. One of the resistance members has gone missing, and your job is to locate them, help them to get free and then, escape yourself. I say inside the room, but your first job is to get into the escape room – even before your timer starts counting down, the game proper begins. As you’d expect from these designers, it’s a heavily immersive environment, so the initial briefing and follow-on introduction are done very much in character. To get the most out of your time, I’d recommend reciprocating and getting into the role yourself. Leave your inhibitions at the door – live the story. Once you’ve managed to gain entry to the room, you’re presented with an impressive environment. It’s very much how I’d imagine an Orwellian 1984 world, with a wonderful clash of things that looked simultaneously futuristic and dated to my eyes. There was plenty to explore and unravel as our group split up and scoured the room. Puzzle-wise, the room had plenty to offer on virtually every front. There was a great variety of puzzles, both in the types of puzzles used and in how they were implemented. Many escape rooms think of a puzzle and then throw it randomly into the process, but here every puzzle was sewn carefully into the lining of the room. And yes, there were codes, keys and padlocks, but they were only used where it made sense and there was never a hint of trying multiple padlocks to find the right choice. Something else I want to highlight was the impressive chaining of puzzles. By that I mean puzzles where you build up a solution through multiple steps. In particular, my favourite puzzle in the room involved five or six different steps to make it work. In any other room, that would have been enough, but here there was obviously a gloriously on-theme reason for solving the puzzle. Top marks! Part of the puzzles being on theme means there’s a sense of being told a story or, more accurately, participating in one – you’re both discovering more about the world of New Pelagia and how it works and finding out how to achieve your ultimate goals of freeing your fellow resistance member and escaping. It’s only in looking back over the details of the escape that I’ve come to realise how often they reinforced the Big Brother nature of the world they created through a range of reminders that spanned the full range from in your face to subtle. If you haven’t noticed by now – theming pervades this room. Even the clue system fits right in – you don’t just ask for clues: you bribe other citizens and obviously this wouldn’t be the sort of room where you’d use a walkie-talkie or just shout over the microphone. This clue system is a joy to use. We escaped with just under 18 minutes left, having taken two clues (although one of them arrived while one of our players was just solving the puzzle). Given recent escape times, and considering we had seven players, I think that places this at the upper end of the difficulty scale. I said I was excited back in November at the potential here, and I’m pleased to say they more than lived up to my hopes. It’s comfortably in my top 5 escape rooms and, were it not for a quirk of fate pushing back our visit by a month, it would have been in this list. The theming was perfect – across the decoration, the storytelling, the clue giving, the characters, the puzzles and the finale. There are surprises from before you start till pretty much you leave the game. The hosts are friendly and fun. I’d highly recommend this to new players and enthusiasts alike. The only caution I’d make is that, with eight people, you’re likely to feel a little blocked at times, particularly if you’re a more experienced player. Aim for five or six players tops. We were in a bit of a hurry, so headed to Brixton Market and ate at Franco Manca. If you’re looking for a quick meal with good service and you like pizza, then I’d highly recommend it. I agree with everything here – I loved this room. The puzzles were great and the acting/briefing really added to the experience but, more than anything, the atmosphere was wonderful. It was reminiscent of the excellent Fallout video game series – this was a dystopian future as it might have been imagined in the past. The props were beautiful (in the way that they looked grimy and functional) and the advantage of having so many of us in the room was that I could afford to take a few minutes, a few times to just look at things and enjoy being in there. That’s a really rare treat! I’m so happy to hear that it’s great! Spark of Resistance is one my favorite escape rooms, and this sounds like Spark of Resistance 2.0. I’m going to have to find my way to London to play it sooner than later. I’d be curious to know how different it is from Spark of Resistance, and specifically whether you could play both without feeling a bit like you’ve already had some spoilers. And yes – come to London. Plenty of good games for you to experience, and a good chance for some immersive theatre too. 🙂 Glad you liked it. I was quite nervous going along, because I’d somewhat hyped it up! I’d love them to open more rooms, but I wonder whether they’d find that exciting – I hope at the very least they stay involved with designing/testing rooms, even if they decide not to stick with escape rooms as their central focus. The character in the room makes more sense now – everything worked flawlessly for us, so it seemed like it was just a bit pointless! Amazing room, we got out with ten and a half minutes spare and were the second best! You still have the fastest time 🙂 Also just behind your time in Mystery Cube… First of the losers hehe!